Bed bugs are a blight to many households. Most people know them as the sneaky little bloodsuckers that take turns feasting on unsuspecting sleepers throughout the night. The parasitic insects are revolting and pose a health concern, even though they aren’t known to spread disease. What they can do is cause itchiness, loss of sleep, and increased risk of skin infection with their nasty bites. If you think that you have bed bugs in your home, here are some signs to look out for and what you can do for bed bugs control. Red, itchy bite marks on areas of the body exposed while sleeping. Bed bug control isn’t easy. The pests are just as hard to completely eliminate as they are to find, but the following prevention tips can help to ensure that they never bug you in the first place. Educate yourself about bed bugs and know the signs of an infestation. Regularly inspect areas where you sleep and rest. De-clutter your home. Bed bugs are experts at staying concealed, so cleaning up your living space, particularly your bedroom, will give them fewer places to hide. Dispose of all items that you don’t need, or store them away properly. Pick up all clothing off the floor. Wash your bed sheets and pillowcases regularly in hot water. Vacuum your home on a regular basis and specifically in the areas where you sleep and rest. Make sure that you don’t miss hard floors, furniture, baseboards, and crevices and cracks. Don’t share sleeping materials or clothing with anyone. Bed bugs hiding on your items can easily transfer to someone else and they could also be transferred to your home. Consider using mattress, pillow and box spring encasements that are lab tested and certified for bed bug protection. Enlist the help of bed bug control professionals at Modern Pest Services. Modern Pest offers customized bed bug treatment control plans to address your situation. The more severe an infestation, the more difficult it is to treat. 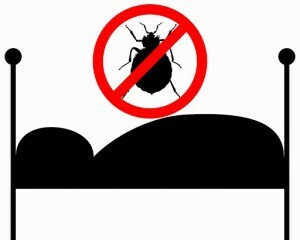 Contact Modern Pest right away at the first sign of bed bugs and sleep easy!